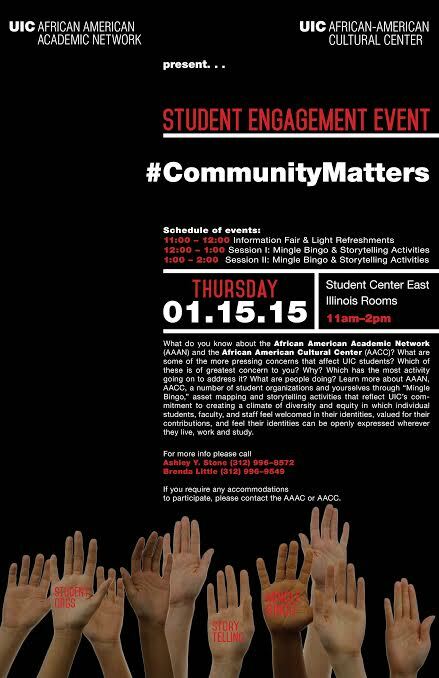 Please join us for a special King Day celebration as The African American Academic Network (AAAN) and the African American Cultural Center (AACC) invite UIC students, faculty and staff to participate in #CommunityMatters, the first event in an ongoing series of student-centered collaborations between the two units. The AAAN and AACC collaboration contributes to creating a climate of diversity and equity in which individual students, faculty, and staff feel welcomed in their identifies, valued for their contributions, and feel their identities can be openly expressed wherever they live, work and study. We look forward to seeing you for an afternoon of conversation, activities, and surprises! Hope to see you there! This entry was posted in AACC news, Black Students. Bookmark the permalink.